The Muppets is one of many shows from the 1980's making a resurgence these days. 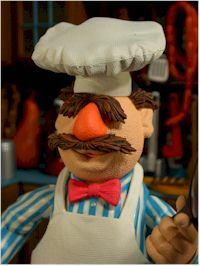 Palisades Toys has been producing one of the best lines currently available based on this license, and they've just hit a new plateau with the release of the Swedish Kitchen (with Swedish Chef, of course!). They've released three series so far - Series 1 with Kermit, Miss Piggy, Dr. Teeth and Bunsen Honeydew; Series 2 with Fozzie, Gonzo, Floyd, and Crazy Harry; and Series 3 with Zoot, Scooter, Rowlf and Lew Zealand. There's also been two previous play sets, The Electric Mayhem with Animal and the Muppets Lab with Beaker. Let's not even get into all the variants on these basic figures! 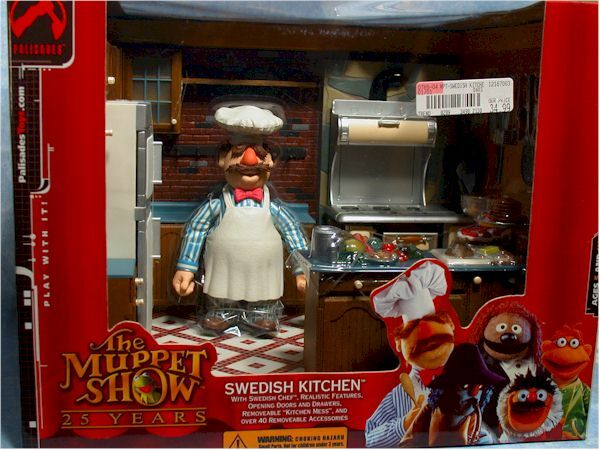 This play set includes the Kitchen as seen on the show, with the Swedish Chef figure. 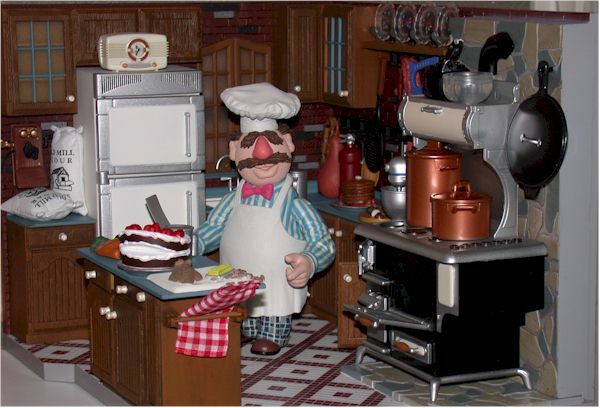 The Swedish Chef was a highlight of the show for many fans, and the excitement over this set has been building since the initial announcement. It's just hitting retail as I type, and I picked it up at my local Media Play for $35. I have a couple on-line options at the end of the review that will save you some cash though. 2016 Update: Keep in mind that this set originally sold for $30 - $35. It now regularly sells for $200 - $300. 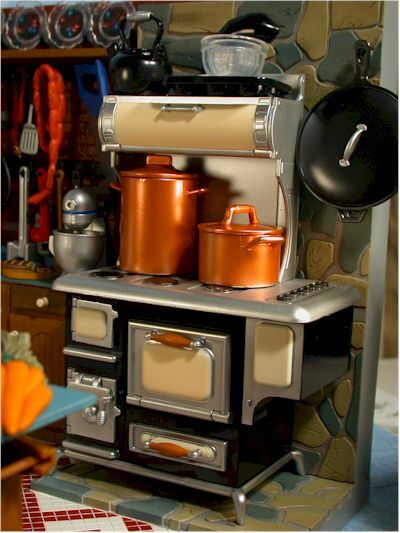 It's not THE most desired of the Palisades Muppets sets (that honor goes to the Back Stage set with the only version of Rowlf, which can net $700 - $800), but it remains highly desirable. It's also still my personal all time favorite play set, and in the 13 years since it's release, there's been nothing produced to take that spot from it. This is still the original package style - with series 4 we'll see a major change. Originally Palisades only held the license to the Muppet Show, and this package design reflects that. The license is expanding, and with series 4 and beyond we'll see this carry over to the card art. The box is huge, solid, and well designed. You can see just about everything, but there's a ton of accessories hidden in a cardboard insert. It's not collector friendly, but once you free this play set you'll never consider putting it back. 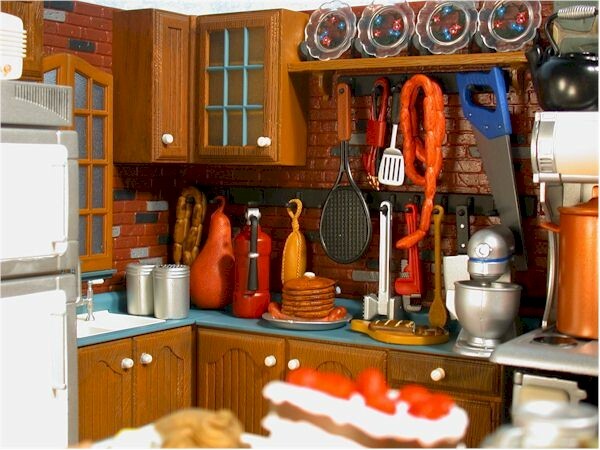 The amount of detail in this play set is astounding. From the tiled floor, to the stone work on the floor and wall around the stove, to the wood grain on the cabinets, every detail is present. Chef looks terrific as well, although his size will throw some people. 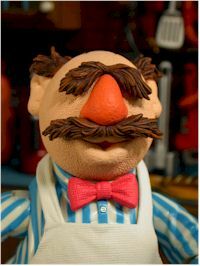 He's the largest figure in the line to date, but remember that his hands on the show were real hands, and therefore he had to be a much larger muppet. All the detailing on the figure that you've come to expect is there, right down to the more realistic appearing hands. The hands are also sculpted to hold a wide variety of the accessories. Every time I look at the set I find something new to marvel at. 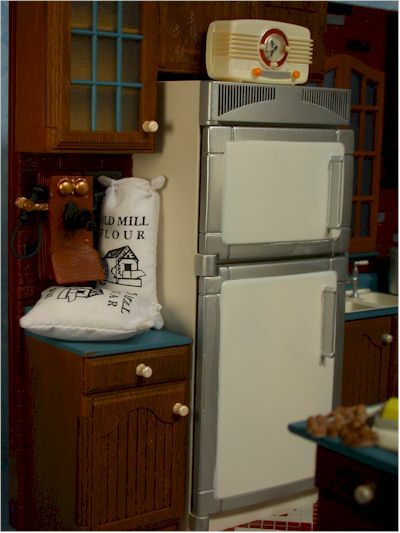 The stove and refrigerator are my favorites right now, because the amount of attention that was paid to the various shelves, doors, and small details. 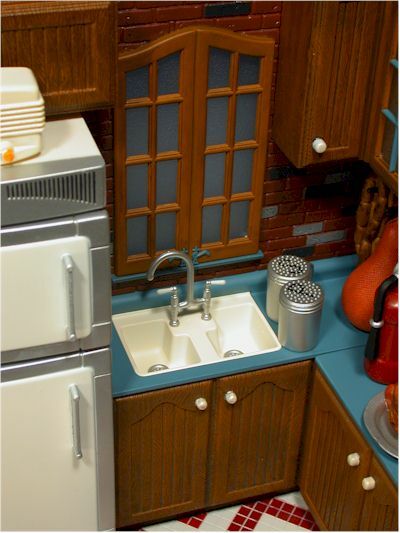 But the entire set shows that level of devotion, including drains in the sinks, the brick walls above the counter tops, and the textured windows. Damn - I wish my kitchen was this cool. On my set, there were occasionally sloppy spots, some around the fridge, some around the tile floor - but considering the sheer number of colors and amazing amount of paint detail, I'd say it's amazing how few problems there were. 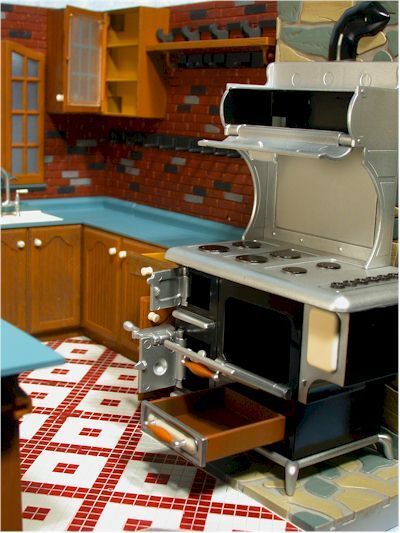 I love the painted ceramic and steel look of the stove and refrigerator, and the coloration on the brick, tile, and stone is extremely realistic. 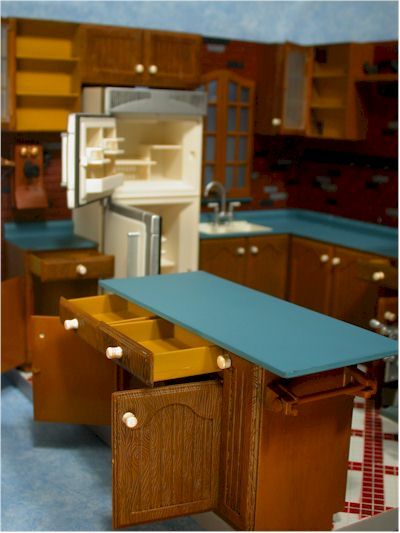 The more you play around with the set and look at the various details, the more you'll find to love. The paint application on Chef is perfect as well. There's a ton of detail here too, with the stripes of his shirt and checks of his pants, but there was no bleed, sloppy lines, or inconsistent colors anywhere to be seen. 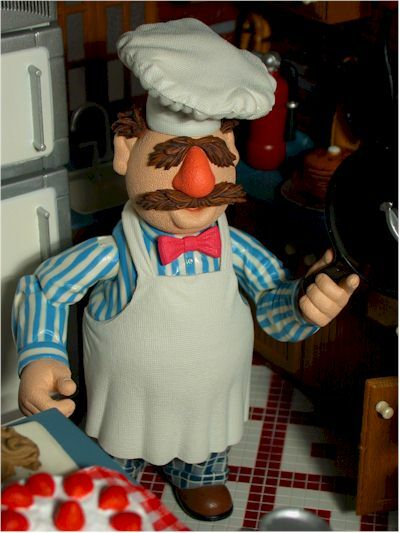 Chef has neck, ball jointed shoulders, elbows, wrists, waist, and hips. It all works well, and allows him most chef-like poses. He's not going to be doing any complicated kata stances, but then he never did on the show either. The set has all kinds of mobility as well. I counted 15 separate drawers or doors that open. I've never seen this level of quality on any play set before, and Palisades is going to have a tough time ever topping this set. And a funky white shelf that I think goes in the fridge, but I couldn't quite figure it out. That's an AMAZING number of accessories. All of them are well scaled and sport great sculpts and excellent paint jobs. Now I have to add to it with additional accessories from other sets, especially in the fridge! There were some plans to include Lobster Banditos with the set, but they just couldn't get them in at this price. 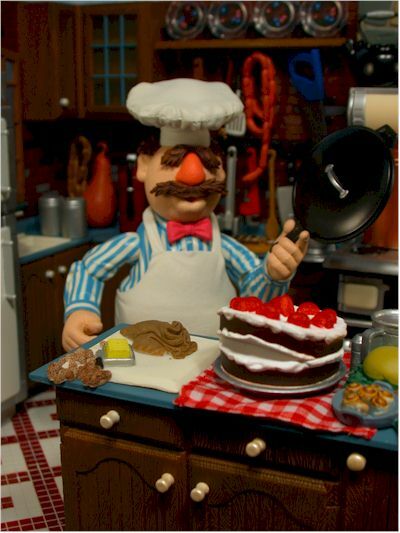 However, there will be a convention exclusive messy Chef available later this year at the San Diego Comic Con (and through the collectors club of course!) that will include three of the deadly lobsters. The set cost me $35 at Media Play, but many on-line outlets are selling it for less than $30. Had I found it on a shelf for $30, it would be a four star value with no doubt whatsoever. Even at $35 it blows away the competition. Is this superior to the usual $50 Batcave? No possible question. Is this superior to the usual $35-$50 Simpsons play set? Absolutely, considering the level of detail and accessories. I'm a huge fan of play sets. They are dioramas that spice up your display when done well, and I've NEVER seen one done this well. This is easily the finest mass produced play set ever, even better than the vintage Mego sets of old. I've never seen this level of accessories and detail in any set. Ken Lilly and Mike Horn at Palisades have hit their high note - I suspect they'll spend the rest of their careers trying to top this one. 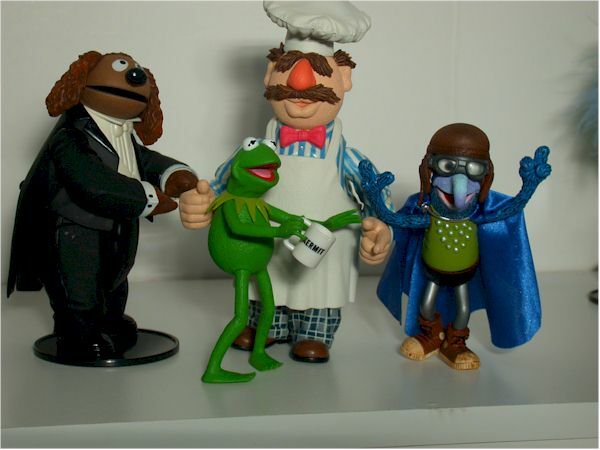 Don't screw up - if you're collecting the Muppets line, buy this set the first time you see it. Don't wait for sales, don't have second thoughts - buy it. If you love the license - even if you don't - you will not be disappointed in this set. To give you some indication of the demand for this set, Entertainment Earth has one of the higher prices on the net for it at $35 plus shipping, and still sold out just through pre-orders. I found this one at Media Play, so Suncoast and Sam Goody should have them in as well. On-line, you can search ebay for a deal. I've covered many of the Muppets figures so far from Palisades, and will be covering many more. As I mentioned earlier, they've released three regular series so far - Series 1 with Kermit, Miss Piggy, Dr. Teeth and Bunsen Honeydew; Series 2 with Fozzie, Gonzo, Floyd, and Crazy Harry; and Series 3 with Zoot, Scooter, Rowlf and Lew Zealand. There's also been two previous play sets, The Electric Mayhem with Animal and the Muppets Lab with Beaker. You should hit the Search Reviews page to find reviews of some of the variants, and in case any other applicable reviews were done after this one was published.